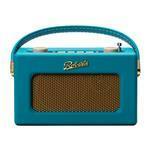 This retro Fifties styled radio is more compact than the standard Revival so is perfect for smaller spaces. With two alarms for weekdays and weekends,the Revival Uno is also the ideal bedside radio for those who'd like to add a bit of style. Perfectly portable,the Revival Uno is both battery and mains powered,so you can take your music out with you into the garden or on a classic British picnic.